Nearly twenty years ago, researchers began noticing a curious paradox in health-focused studies: despite common wisdom that being overweight or obese is unhealthy, a significant number of analyses showed that in a variety of circumstances additional weight is actually associated with a lower risk of death! Unfortunately, these circumstantial, nuanced findings are all too often oversimplified in the popular press, leaving normal weight and overweight laypersons with the understanding that packing on pounds might actually be a good thing. "The obesity paradox caused a lot of confusion and potential damage because we know there are cardiovascular and non-cardiovascular risks associated with obesity," Dr. Sadiya Khan, an assistant professor of medicine at Northwestern University, stated in an unassociated press release. "I get a lot of patients who ask, ‘Why do I need to lose weight, if research says I'm going to live longer?’"
The obesity paradox and all the confusion it still causes likely stems from how we measure and classify what is normal when it comes to weight. The universally-utilized body mass index (BMI) takes your weight (in kilograms) and divides it by your height (in meters) squared to give a neat number. But this tidy value also leaves out all sorts of important information about the body. How much fat do you have? Where is it located? How much muscle do you have? A new study published to PLoS ONE focused on that last question. Researchers primarily based out of the Albert Einstein College of Medicine wondered if the controversial obesity paradox would persist if muscle mass was properly taken into account. Using publicly available data from the National Health and Nutrition Examination Survey (NHANES), they examined the health outcomes of 11,687 participants over an average of 9.3 years. The researchers found that participants with low muscle mass had a higher risk of death at every BMI category. For example, low muscle mass individuals with a BMI between 22 and 25 had a 26% higher risk of all-cause mortality compared to their peers with normal muscle mass, while overweight individuals with low muscle mass had a 49% higher risk of death compared to other overweight individuals. Moreover, the obesity paradox mostly disappeared when subjects' muscle mass was taken into account. As seen in the figure below, without adjusting for muscle mass, normal weight individuals (BMI 18.5-25) had a higher risk of mortality than overweight individuals (BMI 25-30). But after adjusting, they mostly had a lower risk of death. Also notice how the risk for obese individuals (BMI 30-40) skyrocketed after the adjustment. There are a few key takeaways from the study. 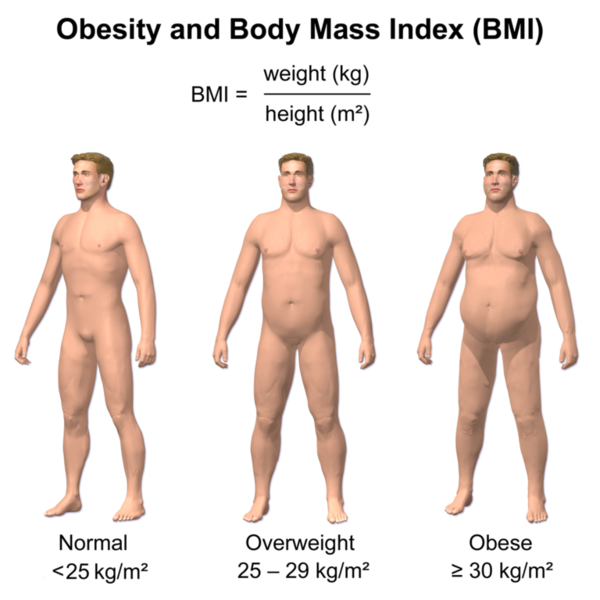 One, it provides another example of how BMI is flawed for estimating health. Two, it shows that the obesity paradox is likely a statistical artifact of utilizing BMI in research, not an indication that additional body fat benefits a generally healthy adult. And three, it suggests that adding muscle mass may promote health and longevity. "Greater muscle mass could protect against loss of functional status due to aging or the onset of chronic disease. The protein stores provided by muscle could be beneficial during episodes of catabolic stress. Skeletal muscle may also regulate whole-body metabolism and inflammation," the authors write. The study has a couple of limitations. Many potential confounding variables like health risks (e.g. smoking and illnesses) and lifestyle factors (e.g. exercise) were based on subject self-report. Additionally, the researchers didn't have enough data to see if there was a dose response from muscle mass (i.e. 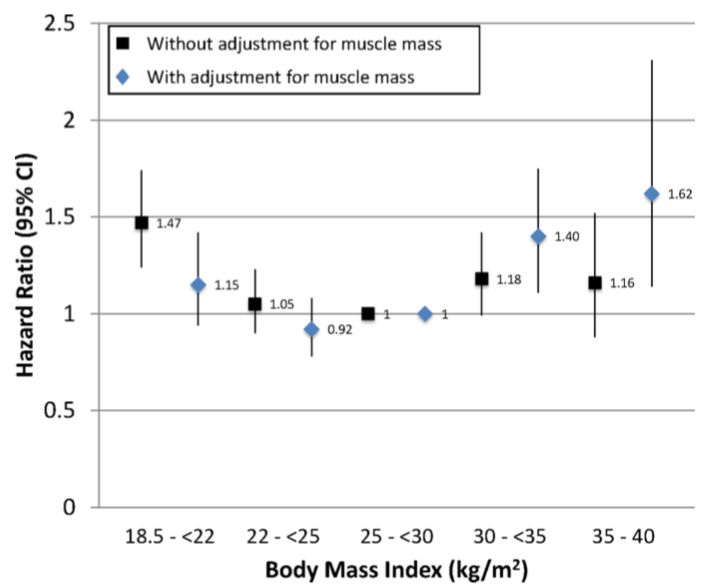 increasing muscle mass leads to even higher reductions in mortality risk). Still, the study represents a solid attempt at critically analyzing the notorious obesity paradox.